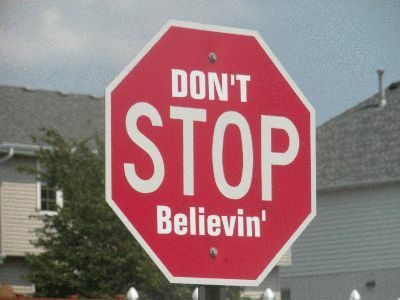 Journey's "Don't Stop Believin'" has been voted the best song for driving, while "Who Let the Dogs Out?" by The Baha Men was picked as the worst , according to an Insurance.com survey. Insurance.com commissioned a survey of 2,000 drivers and asked them to choose the best and worst songs for driving, as well as music that they secretly listen to in the car. Rounding out the top five were Queen's 1975 rock-opera "Bohemian Rhapsody," AC/DC's classic "You Shook Me All Night Long," another Journey tune from the 80s, "Any Way You Want It" and Tom Cochrane's 1991 hit "Life is a Highway." Percentages total more than 100 because respondents were allowed to choose up to five songs. Respondents could also provide their own picks for songs that make you want to crank up the volume when behind the wheel. "Highway to Hell" by AC/DC , "Radar Love" by Golden Earring and "I Can't Drive 55" by Sammy Hagar topped the list of write-in choices. Drivers were also asked to write in the names of songs and artists that make them want to tune out immediately. "Baby" by Justin Bieber, "Wrecking Ball" by Miley Cyrus and "any type of rap" were among the most popular losers. Dude, you so listen to Adele! “Strictly from data analysis we can surmise that the ideal driving songs would be duets with Bruno Mars and Taylor Swift singing old Journey favorites,” said Megna. When guilty-pleasure listening is broken down by gender, tied for the top write-in response for women are gospel music and Eminem; for men, Adele and 2Pac tied for top write-in response.